The Fox Terrier was developed in England by crossing ancient Dachshunds, English Hounds, and later the Fox Hound and Beagle. Fox Terriers are one of the oldest terrier type dogs, originating in the British Isles during the 17th century. They were used by farmers who needed dogs to help get rid of the vermin and other animals that would prey on the farmers stock, such as foxes. The Fox Terrier would find the animal in the ground, relentlessly digging, barking, growling and lunging until it harassed the animal out of its den where the hunter could then kill it. The Fox Terrier was developed with both a smooth coat and a wirehaired coat and both were considered the same breed for many years. The Wirehaired Fox Terrier was bred by crossing in the rough coated black and tan terrier, for use in rough country, its coat being less vulnerable to damage than that of the Smooth Fox Terrier. The first standard for the Smooth Fox Terrier was established in 1876, separating it from the wirehaired dogs. However, it is still considered the same breed with different coat varieties by some clubs, but the two different coat types were separated into two different classes in the United States in 1984. 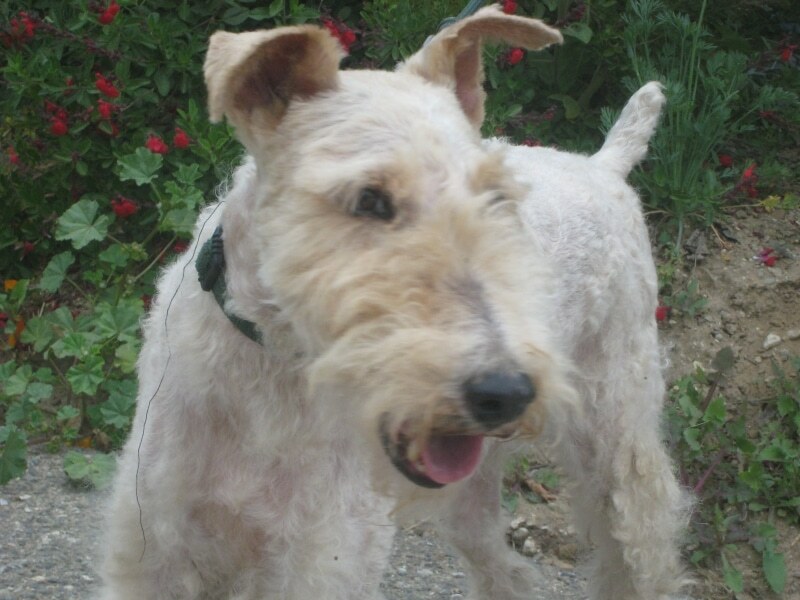 Some of the Fox Terrier's talents include: hunting, tracking, watchdog, agility and performing tricks. •	Playful and Affectionate and intelligent. •	Hypo-Allergenic ~ great for allergy sufferers. •	Love to explore, run and chase smaller animals. •	Can be mischievous and independent, a lot of self-confidence. •	May dig and can be barkers. •	Fairly reserved with strangers. •	Can be scrappy with other dog, will not back down. Need to be leashed outdoors. •	If socialized early can get along with other house pets, but shouldn’t be left alone with cats. •	Moderate exercise needed, not a 'high stamina' dog. •	Coats only need a quick groom 2-3 times/week and shaping every 3 months. •	Known to have a long life span, often 15+ years. •	Do well in obedience, agility and earth trials. Learn quickly. •	Need plenty of mental and physical stimulation to keep them active and distracted. •	Require a fair amount of daily exercise. •	Excellent watchdog, always on guard to protect their home and hearth. •	Can be mischievous……….love to uncover anything and everything. •	They actually love to play in water. •	Can challenge you with housetraining. Need patience……they’ll get it. •	High grooming needs. Do not shed, need regular professional grooming. The Wire Fox Terrier is a happy, eager to please, excitable dog. They are always eager to play and make excellent pets for the active person. They do have a streak of dominance in them and therefore they can become frustrating if they are able to obtain the upper hand in the household. They were originally bred for hunting and tracking and love to dig under fences, in the garden, and even through sofas if the mood strikes them. If they get out of the yard they are gone. The owners need to be patient and have a good sense of humor. It is said that only a very specific type of person can put up with the antics of the Wire Fox Terrier. Because of their nature as hunting dogs, they are driven to chase smaller animals such as squirrels, rabbits, or cats. For this reason, the Wire Fox Terrier cannot be trusted off leash. They need to be leashed at all times because they will run away and chase small animals or start altercations with larger dogs. They can be quite aggressive with a great deal of courage. They will not back down even to dogs that are several times their size. Despite all of this, they are very cheerful and excitable dogs and can brighten even the darkest of days. There are some cautions to be aware of in the Wire Fox Terrier. Although they are said to make excellent family pets and they do love to play, especially with children, they are known to bite. The Wire Fox Terrier should always be supervised around children for this reason. They will react if they are being bothered or pestered. In addition to this, they excessively bark. They are quick to bark at any new sight or sound, so the owner must be equally as fast to stop them. For this reason, the Wire Fox Terrier should not be left outside alone because their barks can be very high pitched and cause annoyance for neighbors and owners. Furthermore, the Wire Fox Terrier has strong defense reactions. For instance, if the Terrier feelings like they were reprimanded beyond what was necessary they are more likely to growl and snap than other breeds. The root of this could be found that they were taught to always be more aggressive than their prey. Maintenance for the Wire Fox Terrier is quite low. The Wire Fox Terrier is a very active and lively breed. It was originally bred for hunting and tracking and therefore enjoys being outdoors. They are known to be very active indoors as well as outdoors. Having a fenced yard does help as they can run and play outside, but they should not be left alone due to their excessive barking and digging. They are quite happy going for long walks but must always be kept on a leash. Their hunting instincts will kick in and they will take off without notice to chase any small animals. The Wire Fox Terrier needs consistent training and so an excellent way to get in exercise and training is to have the dog enrolled in an obedience training class. There are also clubs available for Terriers so that they can indulge in their love of chasing small vermin without actually harming any smaller animals. Training for the Wire Fox Terrier can be a difficult process if you are training them from the time they are a puppy. Puppies have very sharp teeth that can cause a lot of damage and they are also very difficult to house train. It is important that the owner of the Wire Fox Terrier consider staying at home with the dog most of the time at the beginning. The Wire Fox Terrier is known to snap at children as well as other people who reprimand the dog so it is important to socialize the dog from an early age as well as have very consistent and constant training. The training of the Wire Fox Terrier should include obedience tasks because they are highly intelligent and energetic. It is important that the owner or handler of the dog learn to properly raise the dog because the Wire Fox Terrier has a very stubborn and independent nature. They will force you to prove that you can teach them how to do something. It is also important to learn how to properly reprimand the dog to prevent or reduce the likelihood of them snapping or growling at you. Due to the difficult training nature of this breed of dog and the aggression that it can show, it is suggested that this dog is not for the first time owner. It should be in the household of a very patient and experienced handler.